Does Iran play a major role in end time Bible prophecy? What about the Palestinians? On Saturday, November 19, 2011, I was interviewed by host August Rosado of the BlogTalkRadio show Signs of the Times. August is a Bible prophecy teacher and preacher and founder of a ministry called Today in Bible Prophecy. He has and continues to be a personable guest on our television program Christ in Prophecy. He and I concluded with questions from the audience concerning Iran and the Palestinians in Bible Prophecy. August Rosado: Nathan, what do we do with Iran? People keep on asking me, "When do you think Israel is going to attack Iran?" Does Iran play a major role in end time Bible prophecy? Nathan Jones: One of the side affects of the United States attacking Iraq and removing Saddam Hussein is that we removed a check to the mullahs who dominate as a theocracy over Iran. Iran since has been extending its influence and power all throughout the Middle East to create what is called a Muslim Crescent or a Shiite Crescent. The branch of Islam that they follow is Shiite. And so, the Iranian leaders want basically to take over the Middle East and by doing so also take over the nation's riches and power. Sadly, they know they can't get that type of influence without Russia's help, so behind Iran pulling the puppet strings is Russia. Russia has been providing Iran all the nuclear knowhow to build the reactors they're using to not-so covertly build their nuclear bombs which they'll use to follow up on Iranian President Ahmadinejad's threat to "wipe Israel off the map." During the past few weeks the International Atomic Energy Committee, a part of the United Nations, came out and said that, yes, Iran isn't just using these nuclear reactors that they are building for peaceful purposes like they continue to claim. Instead, they are using them to build nuclear weapons. The commission said that they will have four possible nuclear weapons and the capability to launch them by April of 2012. So, that gives Israel maybe as late as March at the most to deal with these weapons. President Ahmadinejad who is the President of Iran is a puppet for the Ayatollahs who run the country. They all hate Israel with a passion, because in Islam if any land is taken away from Muslims they feel it is an insult against Allah and they will do everything they can to get that land back. So, no matter what the West does in the matter of making peace processes and appeasement which never work, there will never be peace because to Islam we have offended Allah. They must defend Allah because in their minds they are in Allah's bad spot right now. They believe Allah is mad at them until they get Israel back. So, they feel divinely justified in wanting to wipe Israel off the map to restore their salvation. All this Islamic talk about them loving the Palestinians is just crazy talk because Iran wants to irradiate all of Israel. You cannot love the Palestinian people if at the same time you want to irradiate the whole country they're claiming ownership of. Iran is a major problem right now, and unfortunately the European Union and American leadership are extremely weak in their response. Russia and China are profiting off of Iran, and so they want to extend to them their support. Russia's support of Iran in part prophetically fulfills Ezekiel 38 and 39 which talks about Iran (Persia) along with a bunch of other countries that have never been united as a coalition before such as Russia, Iran, Turkey, we've got down in Africa Sudan, Ethiopia, and Libya. All these countries that are experiencing the Arab Spring are supposed to come together and unite and attack Israel. God said to Ezekiel that He will show Himself to the world through this attack by annihilating their united forces. Joel 2 says only a fraction of the attacking hordes will make it out of the Lord's supernatural response, and they will all be running off to the northern lands, most likely Siberia. So, we know that Iran with all their yelling and screaming and wanting to kill Israel has no real future. Bill Salus has been bringing up the idea that maybe Jeremiah 49 and the prophecy against Elam which is a portion of the modern day lands of Iran may experience devastation beforehand. Israel could knock Iran back with a preemptive strike on their nuclear facilities, putting them off for a time and that might be a precursor event to Ezekiel 38 and 39. We will have to see how it plays out. Iran definitely has a place in Bible prophecy and it's a place of absolute defeat and destruction. I wrote an article called Timing Gog and Magog where I try to place when Ezekiel 38 and 39 is going to find its fulfillment in the scheme of end time events. To me the most likely fulfillment will be before the Tribulation but after the Rapture. The reason for this timing conclusion is because the entire focus of this battle is off the Church and back again onto Israel. Another sign of the end times is clearly Iran ramping up their relationship with Russia and forming these coalitions. To me it's a major sign pointing out that we are really, really close to the Rapture. 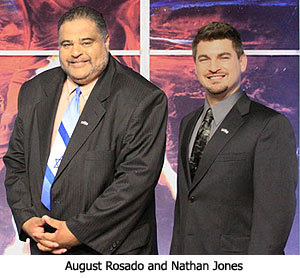 August Rosado: Nathan, what is your take on UNESCO recognizing the Palestinian Authority? Is there any fulfillment of prophecy in that? Nathan Jones: No, UNESCO is a bunch of educating, scientific doves that are Ant-Semitic and hate Israel. They have no backbone and no authority to proclaim anybody a nation. They could say, "Hey, Alaska is its own country." But, it matters nothing. Legally, the United Nations Security Council has to be unanimous on voting a country in. Already the United States said they would veto the Palestinians claim to statehood. We might not have to go that far because the official Council clerk there recently came out and said there is no way there would be enough votes anyway. What UNESCO's vote does do is give the Palestinians a lot of street credit with the rest of the world. The UN absolutely hates Israel. It spends all of its time making resolutions against Israel. With all the horrible government crackdowns on protestors going down in Syria, and also with the Islamic attacks on Christians down in the Sudan, you'd think the UN would be dealing with those important issues, but they could care less. The United Nations votes based on the bunch of Communist countries and Islamic countries united into one voting block. They took over the UN from its original purpose of bringing peace and justice to the world. Now it exists solely as a paper body which lives to hate Israel. I believe the UN as a governing body will be abolished at some point when the Antichrist becomes the world leader. So, UNESCO could vote on even me becoming a country, but it wouldn't matter. Their vote is just symbolic and only proves how Anti-Semitic they really are. August Rosado: You know in reference to UNESCO, the United States just cut off all of our funding for them. I understand that they are pretty much hurting right now financially because of their move to vote on a Palestinian state. Like you said, it means nothing and I agree it means nothing. By them recognizing the Palestinian Authority they are hurting financially now because the US has just stripped them of all their support money. Nathan Jones: We have such a large Jewish remnant residing here in the United States. In a recent congressional election the Jewish vote filled a seat in NYC with a Republican which hasn't been done in decades. It shows that these little local elections really can make a big difference in larger government affairs because they send a message like this time to President Obama saying, "You are losing the Jewish vote!" In response to the NYC election, all of the sudden Mr. Obama is coming out now supposedly trying to support Israel while trying to sound touchy with the Palestinians. Still, I think Mr. Obama has revealed his cards pretty well in the past showing that he is totally Anti-Semitic and is all for the Muslim and Arab countries coming against Israel. We read in Ezekiel 38 and 39 where it talks about how Sheba and Dedan which are the Arabian countries and the young lions of Tarshish which could be the United States, Canada, and Australia, well we all sit the Gog-Magog invasion out. The United States and these other nations will just watch and see what will happen. So, we know the United States isn't going to do more than cut funding and veto things. We aren't seriously going to go out there and defend Israel according to Ezekiel 38 and 39. We are pretty much just going to watch and see what's going to happen. August Rosado: There's been a report of the Arab Nations preparing to strike Iran. Do you think this is a fulfillment of some Bible prophecy? Nathan Jones: The Arabs could strike Iran, but I highly doubt it. Like during Ezekiel 38-39, they'll just watch, letting Israel do their dirty work for them. Saudi Arabia may contribute passively by letting Israeli warplanes fly through their airspace. When you read the nation list of Ezekiel 38 and 39 you will notice there are a number of Arab countries missing. You will notice all the surrounding countries around Israel are not listed in the countries uniting to destroy Israel in the Gog-Magog Battle. These missing nations are Egypt, Jordan, Syria, Lebanon, and Gaza. How could they be missing? They absolutely hate Israel and want her destroyed. This absence tells us that there must be a Bible prophecy that needs to be fulfilled before Ezekiel 38 and 39. I believe that prophecy can be found in Psalm 83. Psalm 83 will most likely be the prophecy that fills in this missing piece. Israel will then have to subdue the nations around it before Ezekiel 38 and 39 can be fulfilled. Question? Are these prophecies and battles of Ez.38,39 and Ps.83 etc. part of the birthpains or part of the tribulation. I can see these wars causing great famines, deaths, plagues etc. Where are these or do we know? Because if the Church is not to go through God's Wrath and we are here, this is not God's Wrath. If we are gone then God uses man's own evil and destruction against himself. And I know there is scripture where God says something similar. The reason I am asking is that I fear people will see the wars and think God has left them behind. Anon that is a good question. i in know way speak for Nathan but i do share his veiw of placing gog/magog AFTER the rapture and BEFORE the tribulation so the church is gone. as for psalm 83 and the destruction of Damascus i am less certain of its timing xept that it occurs BEFORE gog/magog. i think the rapture could precede this battle too but i don't know. The Destruction of Damascus occurs during the Gog/Magog Battle, Syria will be the staging point for the gathering coalition, in fact they are being gathered at this very moment. Russia, Iran, Hezbollah, and Hamas have a presence in Syria. Turkey, Jordan, and Saudi Arabia representing the Sunni side of the equation have already chimed in with their alliance with the West. The U.S. and N.A.T.O. have allied themselves with the Muslim Brotherhood and Al Qaeda to seek to overthrow Assad, yet Syria is not Libya! Israel is being surrounded on all borders, Shia and Sunni forces are battling for dominance yet soon will turn their attention to a perceived common enemy. For those that continue to speculate that Israel's immediate neighbors are not included in the Gog/Magog offensive, perhaps they might want to consider Ezekiel 38:21. The "mountains" in this context refers to the borders of Israel and those nations within those borders will in a frenzy begin to slay each other. It is important to recognize the truth, rather than speculate! Psalm 83 is not a conflict to come but a prayer for divine intervention that will be realized during the Gog/Magog Battle of Ezekiel 38-39. The United States as well as Israel have failed to confront Iran militarily, as is the case for Syria, this has served to embolden their enemies. I know without a doubt that the U.S. nor Israel will attack Iran or Syria and in fact will result in the rapid deployment of the Gog/Magog invasion force against Israel. from Ezek Gog Magog list, and the prayer seems to be answered in Isaiah 17 meaning it's likely to be pre Ezek. Take care and God bless you much. The opening of the Seals in Rev 6 names the methods that God always uses through-out History to judge mankind and Israel. These are called God’s Four Sore Judgments in Ezekiel 14:21. See from vs 13 as demonstrations of how God always judges. Its worth noting because some claim the first half of the 70th Week are Satan’s wrath and not God’s. However God also uses Satan AND Gentiles to dispense His judgments. Nothing happens unless our Sovereign God sanctions it. Leviticus 26 shows the Blessings and Cursings to Israel with the same four judgments getting worse by x seven. The Tribulation only has three lots of sevens in judgment. I have wondered if the missing fourth judgment concerns the seven thunders John is told not to write down in the Revelation. We know God has shortened the Tribulation, in case none survive, it makes me wonder if this is by withholding the fourth lot of sevens in the final dishing out of His ??? Just a thought. So no, we aren’t in the 70th Week, some dispute we are experiencing the birth-pangs, but I believe they started with the two World Wars as seen in Matt.24:7 and vs 8 says ‘these’(in vs 7) are the BEGINNING of the birth-pangs. The previous signs in vs.5,6 are ‘non’ signs, rather things to be expected, but THE END IS NOT YET. Sorry, I have put that backwards, I am too tired to alter it so I hope you can follow my thoughts? I have read some Islamic eschatology. In the Shiite version, they believe the Mahdi is going to come back (with Jesus as his Lieutenant)and lead the "true Muslims" in Killing all the Christians and Jews to set up a world wide Caliphate. I can't help but wonder if a world wide disappearance of Christians were to occur (the Rapture), how hard would it be for the Imams to convince their people that it is the "Mahdi" that "took" the Christians. AND, that the Muslims world wide need to Join them in trying to help him eradicate Israel! Israel's victory (in Psalm 83) would make them boil and be more determined to come back with a vengeance and lots of help (Russia,Turkey etc) in Ezekiel 38-39 battle. Yes, some do make this claim, but looking at historical events alongside the Bible we can say that Damascus is the oldest, longest surviving, habited city in the world. It has indeed been fought over and even captured, but in all that time, it has NEVER ceased from being a 'city', just change of ownership, and it has NEVER become a 'ruinous heap' because it's still standing! Therefore it is still a future prophecy that is fast running out of time to fulfill. I am doing this from memory as it is nearly 1am and I am too zonked to study properly. Its easy enough to Google to check with history. Ed Hindson is no diff to the rest of us, he doesn't always get it right either but it isn't a 'deception'; but I am really glad you are questioning/testing and not just accepting things because 'so and so' said it. Thank you all for the answers to my questions. It helps me to understand so much better. Sue ...... as i continue in prayerful study of isaiah ch 14 and ps 83...... i feel there is no question this prophecy is yet to be fulfilled. I feel led to see this.. especially when i thought long and hard about verse 7..... and verse 14 i think is referring to a/c. Onward!!! I love learning Gods word!!! And thank u for helping me sooo much! I am just learning the whole "google" world now!! I dont have a computer so my little smart phone is sometimes difficult to use while doing any extensive research! But im grateful i am learning cuz altho im content in all things.. shalom...... i am also hungry to be filled with His knowlege and wisdom always! Vs 14. What about 'at eventide' and 'before the morning'. Literally 'overnight'! (context)? My little secret is every morning, when I switch on the news, I wonder if the news-bar will announce something like "Damascus and Syrian forces razed to the ground overnight”. Sorry Susie, I keep forgetting you aren’t on line. I wouldn’t be able to SEE a phone, let alone actually hold one. ;) Before P.C’s. I used the lending library to study and I have acquired my own mini library over the years. Where there’s a will theirs a way… I shall try harder to help. Mountain – Har - literally a mountain or hill. In this instance the Mountains of Ephraim or the Golan Heights. Upon which God Himself will bring His sore judgment of the sword upon the invaders of Gog Magog; and the sore judgments of pestilence and severe weather with fire and brimstone and a shaking of men, creatures and the earth. It is better to recognise the literal truth rather than speculate out of context. The context is plural "mountains", Har does not apply here! This is a designation for the borders of Israel! Good try E.I.! Funny, I thought you said you read the original languages? Har (het, resh) is what it says in the Hebrew, singular not plural; which makes no odds as it says nothing about ‘occupants’ and the context involves the invading Gog armies that will attack at the historical northern tip of the Golan Heights and overun the land. The few years that I have been on this prophecy forum, I have attempted to show that the Gog/Magog Battle of Ezekiel 38-39 is imminent, even more so now! Yet in all this, what I have shown has either been ignored or dismissed. I have shown that it is the Lord God that brings these enemies against his people Israel that today continue to pollute his holy name as recorded or documented in Ezekiel 39:7. Israel has forgotten the promises of the Lord God and has sought agreement in dividing the Land among their enemies to appease them. I have also shown that the term "unwalled villages" as recorded in Ezekiel 38:11 identify clearly with Jewish Settlements, not cities, though later identified in Ezekiel 39:9 as those that dwell in the cities of Israel will gather and burn the weapons of their enemies. I have further shown that the term "safely" provided in Ezekiel 38:11 is given as the Hebrew word betach, which has dual meaning and within this context means having false confidence, false security, and careless. The same term is given in Ezekiel 39:6 describing the careless nations that will be recipients of fire from heaven. cleansing of the land for 7 months. I have also provided evidence to the contrary of popular belief that Israel's immediate neighbors are indeed included in the Gog/Magog coalition as Ezekiel 38:21 clearly describes. The context reveals that all the nations bordering Israel will slay each other. I have also included in my study that this battle corresponds with the end of the Church Age as identified clearly in Ezekiel 39:29as the Holy Spirit is poured out upon Israel. In conclusion I have provided a detailed analysis of this prophecy that indicates that the time is near and nothing need proceed it's fulfillment. You are so self confidently convinced by your personal interpretations, that many others, here and elsewhere, have pointed out the huge swathes of flaws in you inexpert studies based on wishes not facts. I have the strongest feeling that you have appointed yourself as a prophet and fully expect your ramblings to be embraced with none daring to expose your follies. The one thing I agree with is the meaning of the word 'betach' which is 'security; that I had observed many years ago long before your forced entrance onto this stage looking for followers. No Rodney, all you have 'shown' us is ineptitude for eschatology, which, without L&L; who in their good grace endures your frenzied declarations, all ripped from their God given context. Without this captive audience, where else could you launch to announce such fantasies having being ejected from all other platforms to spout your self deluded prophesying, you would have no audience whatsoever. Well I suppose you COULD have a following as you have advertised yourself shamelessly in the only place that puts up with you. Sadly you have not been followed back to your Facebook because you do not inspire with your irritating and tedious, out of context, strangled sermons. Pray for a ‘Philip’ to explain matters to you, and then, should you listen, you may discover a reversal of fortune should you drop your desperate need for attention. Regardless, your misplaced over confidence makes me cringe for you. Its not a very pleasant feeling. The context of Ezekiel 38:21 designated as "my mountains" identifies with "Eretz Yisrael" or the recognized borders of Israel. This is a declaration by the Lord God shared with that of Joel 3:2 in which the Lord reveals ownership of the Land for which the nations seek to divide or partition. E.I., you have no proof to offer that what I have presented is in error, yet you continue to conclude that I am the greater fool! I find that rather amusing! Rodney I wouldn't dare, or want to call you, or anyone else a 'fool'. That is YOUR choice of words not mine. Just as you have chosen to use the word 'idiot' to describe me by. Well Rodney, I have already agreed with you that I must be an idiot to be the only one (mostly) that bothers with you. So I’ve got it! Ok? EI/Sue is an IDIOT because Rodney says its true, therefore it is as Rodney says! To be clear about it ‘idiot’ is an insult, an offensive term used to deliberately insult somebody’s intelligence; defined as having an IQ of about 25 or under with the mental age of less than a three year old. Presumably evidence of my having senile dementia, as they call that the 2nd childhood. You may as well go the whole hog and declare me to be insane! In case you should think I am sense-less as well; yes it does hurt to the point of feeling concerned that you might be right about me. I can only trust Nathan with this, that he will intervene with any signs of dementia I may be portraying and be kind enough to explain it to me. There is no way I want to be 'humoured', as you put it, all the while bringing dishonour the The Lord as well as L&L. Please Nathan; seriously, I am trusting you with this. I am working slowly to give you the evidence that I see in Scripture, on two specific points at this juncture, that your personal interpretation is wrong. 1)Joel 2:1 and Ezek 38:21 are separate conflicts and do not occur at the same time. God willing I will be back to give my evidence. Reading as much between the lines of Rodney’s comments, as what he actually writes; his view is substantially, but not completely of the Postie view, using the same spiritualising interpretation. This better describes his insistence that his understanding is one of a spiritual nature while claiming to invoke the Holy Spirit. I am convinced that Rodney sees himself as a chosen, end-time prophet. His positioning of the Rapture is neither here nor there. There is a mixing of un-related Scriptures that strongly hints Rodney is placing the Ezek Gog Magog conflict at the end of the Tribulation and at the same time trying to place the Millennium Temple at the start of the 70th Week. The confusion is enormous as he is fundamentally trying to do a mix and match of all the views. He has no structure to work from and is inconsistent. Rodney is combining the Ezek 38/39 Gog-Magog war with Joel’s ‘army’. The term ‘the Day of the Lord’ or ‘Day of Jehovah’ always refers to the 70th Week Tribulation! The term ‘latter days’ sometimes refers to a particular time period meaning, it’s the end of that timed event! Or, it concerns the span of time between the cross which will end at the 2nd Coming at the end of the 70th Week, otherwise known as the ‘TIMES of the Gentiles’.Luke 21:24.beingthe end of Gentile rule on earth. It seems to me that Rodney confuses the political ‘Times of the Gentiles’ Luke 21:24; with the ‘Fullness of the Gentiles’ Romans 11:25.which is the completion of the Jew/Gentile Church. The timing of the Ezek Gog-Magog war can only be Pre-trib. The ‘latter days’ are NOW as Israel has been bought back from the sword and is a reborn nation and is secure in her own defensive capabilities during peace or conflict. The modern kibbutzim ‘villages’; like most of the western world, do not have defensive walls even in remote locations. A sign of the times we now all live in. The invading Gog army is described plainly as being of flesh and blood riding real horses. After death, their bodies will be eaten by the birds. They will ALL die by natural disasters and by killing one another. Mother Russia will also be devastated. In comparison to Joel’s invasion; they are not even remotely the same ‘army’ or event and the timing is also quite different. In Joel, the invaders only have an ‘appearance’ of horses; vs 4. They shall run LIKE mighty men and march forward in ranks as soldiers do and swarm all over the land of Israel. They will behave like locusts, devouring everything around them. So this isn’t Gog’s army brought forth by God. This army is timed AFTER the Ezek war, and this army is not killed on the mountains of Israel, or eaten by birds. This army is a swarm of horrific demons that spew out of the pit when the 5th Trumpet is sounded in Revelation 9. These are not insects, as locusts have no king (Prov.30:27)These do have a king to lead them and the leader is possibly the resurrected a/c who receives a fatal head wound when fighting with the 10 kings Dan.11:45; Rev13:3. Here he is called Abaddon and Apollyon maybe because he is here totally possessed by the Great Dragon Satan. The timing of this invasion is MID Tribulation at the end of the first 3 ½ years. So Rodney the Bible evidence is against you on two more counts, in addition to all the previous evidence against your personal interpretation. Ezek 38/39 is NOT the same as Joel as you claim AND the timing is quite different, all because you are mixing and matching Scriptures that do not belong together exactly as the C.T. Posties do. That's as short as I can make it - otherwise there is enough evidence to write a book. You have done the same with the Tribulation Temple which is NOT the Millennium Temple – and yes, I have Biblical evidence, but that’s for another comment. Indeed the Gog/Magog battle is PreTrib and in fact will occur within the next few months! My comparison with Ezekiel 38:21 and Joel 3:2 was to identify that the Land of Israel belongs to the Lord thus the designation (my mountains), not to suggest that they are the same battle! Going further the context of Romans 11 identifies that a determined number of Gentiles (only God knows) will be grafted in to the Cultivated Tree of Promise, then the Church Age will expire. The Lord will then turn his focus again upon his people Israel, removing their stoney heart and their blindness in an effort to redeem them, that the natural branches be restored. The restoration of Israel back into the Land coincides also with the time of refreshing, when the Lord will send upon them the former rain and the latter rain. The purpose of gathering Israel is to redeem them, to fulfill the promise of restoration and redemption for the sake of his Holy Name! The Lord in the first month (Nisan) will send a teacher of righteouness and will pour out his Spirit upon the house of Israel, that the people may know him! That all Israel might serve the Lord God, for this is their heritage and the promise of God unto them. The Lord God has not cast off his people, "Boast not against the branches. But if thou boast, thou bearest not the root, but the root thee"-Roman 11:18. "As concerning the gospel, they are enemies for your sakes: but as touching the election, they are beloved for the fathers' sakes. For the gifts and calling of God are without repentance"-Romans 11:28-29. The Lord God has plans for his people Israel and will deliver them in a Time of Trouble. The Apostle Paul also delivers a warning to those Gentiles that boast and with pride show no mercy upon Israel concluding them forsaken of God. "Thou wilt say then, The branches were broken off, that I might be grafted in. Well; because of unbelief they were broken off, and thou standest by faith. Be not highminded, but fear: For if God spared not the natural branches, take heed lest he spare not thee. Behold therefore the goodness and severity of God: on them which fell, severity; but toward thee, goodness, if thou continue in his goodness: otherwise thou also shalt be cut off. And they also, if they abide not still in unbelief, shall be grafted in: for God is able to graft them in again-Romans 11:19-23. If then you can show no mercy, then neither will you know mercy! "The fear of the LORD is the beginning of wisdom: and the knowledge of the Holy One is understanding"-Proverbs 9:10. I will continue to address subject matter as it relates to specific comments of mine, yet I will not respond to personal attacks that come as a result of the lack of knowledge or understanding by some participants. I will keep the peace and only interject when a reponse to what I have presented is being twisted and perverted to suit the responder's agenda. I have to admit I can usually not follow the arguments of Sue and Rodney. The conversation is over my head as they seem to be on a higher level of education and understanding than I. But sometimes the learned are not portrayed very flattering in the Bible. So I guess that means there is room for the less wise to comment too. I think most all of us agree the end of this wretched world we have created is thankfully nearly over so soon we will be in Heaven together and I guess by then we will know for sure who is right...Sue or Rodney or neither. But honestly, I think at that point no one will care. I think the bickering and arguing we all do on here at times will be forgotten and we ALL will be back at square one in our education about The Word. So how about a truce for now. Forget who is right. THINK ABOUT IT! WE ARE ALMOST AT THAT DAY THAT JESUS WILL BE CALLING US HOME ALL AT ONCE!!! SEE YOU ALL SOON! After I read Rodney's comment "I have attempted to show that the Gog/Magog Battle of Ezekiel 38-39 is imminent, even more so now!" I was moved to post the comment above. His comment made me think about the state of the current world situation and I, too, think Gog/Magog is imminent more than ever. And since I believe the Rapture will likely occur before Gog/Magog I was thinking how close we could be to that glorious event. I was so overwhelmed by joy over that prospect that I was kinda bummed that two Christians (Sue and Rodney) were bickering when the most wonderful day for a Christian is near. That was the context of my comment. I'm not saying you shouldn't post and discuss these things. That was where my mind was. No offense meant to anyone. It makes me sad that you see this as 'bickering'. This has been about exposing the error Rodney's uses with his own personal method of interpretation, with which, he is muddying the prophetic waters and causing confusion. Susie has found this to be the case, as have I, and by your post, he is confusing you too as you watch me chasing him around with the salt cellar to sprinkle on his deceiving ‘tail’. Remember Mitchell? He and Rodney would get on as they are on the same Postie wavelength. I have worked long, hard and prayerfully to show everyone, exactly where the end is in this mess of ‘spaghetti’ Rodney keeps dumping into our laps. Plus, he invents arguments, lays them at our feet claiming them as ours; then, proceeds to demolish same arguments thus evading questions he cannot answer from his Postie interpretation. They call it ‘Straw-men, in the US and Aunt Sally’s to the U.K. Set them up to knock them down. It’s a deliberate misrepresentation of beliefs. This latest response shows Rodney has realised his mistake and has done a duck and dive to slide under the ‘radar’ to craftily try and twist his former position. He has not answered honestly, and has produced a load of half true waffle to try and cover his tracks. It is the nearest thing to a compliment that I will get from him! He knows, that I know, that I have showed him up in his pretend interpretation. WHERE has there been any ‘boasting against the branches’ Billy? Honestly now, have you see that here? It isn’t here, it is Rodney inventing fresh ‘snow’ to try and cover his tracks of error. Rodney is deliberately and persistently confusing issues to try and back out of his faux pas. As for Gog Magog being ‘imminent’; no, it isn’t Billy! Only the Rapture is ‘imminent’, and remains as imminent now as it was in Paul’s day. The Gog Magog war prophecy is fast running out of time to happen, and can’t help but be getting closer. Rodney’s twists and turns are aimed to take eyes OFF Jesus’ imminent Rapture and ONTO the Gog Magog war (that he is confusing with Armageddon anyway) which is where he has his eyes fixed on his ‘alternative’ Pretrib position; because he scoffs L&L imminent Rapture stance. To add insult to injury, he has the brass necked cheek to accuse me of ‘attacking’ him just because I have successfully been exposing his many errors of interpretation; all this after his spiteful name calling of me. When I get things wrong, it makes me scratch my head, take stock and finally be grateful to have been shown my mistake so I can rid myself of it and go on to know the truth. That is how I have learned everything I know, the hard way and I have never thought of it as an ‘attack’. That is the ploy of deception; put the guilt onto someone else and hide. God bless you Billy! This year in the heavenly Jerusalem, but preferably TODAY! Maranatha! ‘Mrs C’ has written the following understanding of Psalm 83 and Isaiah 17. I largely agree with her. Psalm 83 is not a war, but it is an imprecatory Prayer for God's Victory over Israel's enemies. God does not say anything in His Word about a war in Psalm 83, if there was one He would say it and He doesn’t..
Psalm 83 espouses "talk", a "conspiracy", by the enemies surrounding Israel. There is no action it’s all talk, and as we can see, Psalm 83 is ALREADY being fulfilled before us. Psalm 83 concludes with a Prayer for the destruction of these enemies. Isaiah 17 is the answer to that Prayer. There are false teachings out there that will at times, briefly mention “Damascus” being destroyed, but don’t even quote Isaiah 17. Why? Because to read all of His Word in Isaiah 17, would debunk the “idea” the “theory” they promote about Psalm 83. Men are fallible, Gods Word is not. This Psalm 83 teaching; piggybacks other Scriptures to lead down a rabbit trail, with suggestions that Israel will become “wealthy” etc. Gods Word says nothing of this, in fact He says just the opposite. Reading all of Gods Word in Isaiah 17, rather than just Verse 1, tells us that Israel will not become "wealthy', nor "land barons" as is falsely suggested. Rather they will fight a multiple fronted war, completely alone, and God tells us why He barely allows His people to survive. Israel is desolated as Gods Word tells us. Psalm 83 is already being fulfilled. Why is this so important? Because it causes Brothers and Sisters to Witness falsely to Believers and un-Believers alike. We are at a crucial point in the fulfilment of Prophecy. To promote the “idea” to others, that Israel will become “wealthy” and “powerful” etc., and just the opposite happens, we cause disappointment and invalidate any Witness given for the event. Should the Lord tarry, and we witness the absolute horror of the Isaiah 17 war, it will be a powerful Witnessing tool. But we can expect persecution for such a Witness, as with all of the massive death and destruction, the “world” will not understand why we are so excited about it. It will be “oh those crazy Christians are actually excited about this” kind of response. Isaiah 17 is the beginning of the end of the Church Age, and it is God Himself bringing Israel to their knees, just as He wants them to be. Israel will be completely helpless, and that sets the stage for the quickly following Ezekiel 38 invasion. With Ezekiel 38, it is God and only God whom can save Israel, and ALL of the Glory will be to Him. It is God Himself that orchestrates both the Isaiah 17 and Ezekiel 38 wars. Most importantly, is Gods Purpose for these wars, and that is to fully restore His Covenant with His People, and return to them. He has turned His attention away from the Church, and back to His People. We the Church are gone! Praise God Forever! 13. O my God, make them like a wheel; as the stubble before the wind. Before the whirlwind. 13. The nations shall rush like the rushing of many waters: but God shall rebuke them, and they shall flee far off, and shall be chased as the chaff off the mountains before the wind, and like a rolling thing before the whirlwind. Israel will have fought a war involving multiple fronts. Isaiah 17:12-13 The enemy nations surrounding Israel- attempt to "rush in" to finish her off. This is when God does intercede, at the end. He rebukes these nations, so as His people will not be wiped out, and the people of these nations "flee a far off". Isaiah 17:14 - Gods Word tells us that Damascus, will be gone in less than a day. As said before, Israel will have fought this Isaiah 17 war, completely alone. They will barely survive, have exhausted all of their weapons and no way to resupply, and the "world" will hate them even more than they do now. Israel will no longer have to worry about the enemy nations that surrounded her, but they pay a very heavy price for this. Israel is severely wounded, and defenceless. This sets the stage for the Ezekiel 38 invasion. Israel will be in a primitive state, and so will the invading Ezekiel forces. At the same time, we have to consider the fulfilment of the Judgment that comes against the nations surrounding Israel. God had Ezekiel devote 8 Chapters in the Book of Ezekiel, to the destruction of these surrounding nations. 21.I will make thee a terror, and thou shalt be no more: though thou be sought for, yet shalt thou never be found again, saith the Lord GOD. I woke up one morning and see the following article about the “wheels” in the ME, and I was filled with emotions. This is just amazing, wondrous, to me. I could hardly process it. “Wheels” are what the Prayer of Psalm 83 asks God to turn the enemies of Israel into, and then what He does indeed do to these enemies, in Isaiah 17! They are the Psalm 83 Prayer, right there on the ground for God to see from above! X marks the spot! It’s like they are saying “remember God, you will turn these enemies into “like a wheel; as the stubble before the wind.”! It’s like bull’s-eye targets drawn on these nations! The fact that these “wheels” are best viewed from only above, and to look at the ME nations they are located in, in association with Isaiah 17. Syria, Jordan, and “other nations that rush in”, and the timing of this! And - what are “kites”, or “desert kites” that some of the “wheels” are drawn on top of?. They were named “desert kites” by British air force pilots when they first flew over them in the early 20th Century. What were they used for? They were built with low level walls, and migrating gazelles would be funnelled into enclosures where they could be butchered en masse. As I tried to point out in my follow up comment...I was saying my first comment was when I was in a certain frame of mind. I suppose my choice of the word "bickering" wasn't a good one. In my second comment I said "I'm not saying you shouldn't post and discuss these things." You know I've gotten into knock down brawls on here before. You're right. You need to make things clear for people like Susie (and even me) that need clarification from posts from those like Rodney and the infamous Mitchell. Like I said...I was in a different place mentally last night. Anyway, I was on vacation. Was with family at Christmas and had a wonderful time. Now I'm back with my Lamb & Lion family and still having a wonderful time! However...... the whole thing with rodney and Sue could be avoided completely and in my opinion it is quite obvious to rodney himself how arrogant and self indulgent with scripture he is. Yes they shouldnt go at it. .. until Gods word is i picked apart erroneously and confusing misinterpretations are put out there to mislead those searching to know the truth. I cant recite a lot of scripture but i know in my heart if could..... i would stand up for the truth with everything i got like sue does. I think we need to be ready for situations just like it so we too can defend Gods prescious word from downright incorrect muddled interpretations. God bless you my bro. Billy. Now its my turn to be in a 'funny mood'. Anyway, I have 'cobbled' the following together as my 'heart' has gone out of it all now. Thank you for being so kind a patient with this old bat. “A few short days after the foundation of the Temple is laid, the Lord God will pour out his Spirit upon the house of Israel as documented in Ezekiel 39:29 and in complete prophetic fulfillment of JOEL 2:28:29. "And I will set my glory among the heathen, and all the heathen shall see my judgement that I have executed, and my hand that I have laid upon them"-Ezekiel 39:21. "Neither will I hide my face any more from them: for I have poured out my spirit upon the house of Israel, saith the Lord GOD"-Ezekiel 39:29. "And it shall come to pass afterward, that I will pour out my spirit upon all flesh; and your sons and your daughters shall shall prophesy, your old men shall dream dreams, your young men shall see visions: And also upon the servants and the handmaids in those days will I pour out my spirit"-JOEL 2:28,29. Not one scrap of Joel is linked to the Pre-trib Gog Magog war or the 3rd Temple which is paid for and erected by apostate Jews. It is a house God did not ‘order’. However, John is told the ‘measure’ the Temple and the Altar (incense) and the worshipers who will be using the Levitical sacrifices in the same way the Hebrews believers did who went back to the Temple as a result of persecution. To ‘measure’ means in God’s sight it ‘measures up’ and is not called apostate; just as the same practise by the Hebrews was not called apostate either in the N.T. New believing Jews will be worshiping there as God sees the Christ cleansed heart of the man, not the sacrifices that are in remembrance of what Messiah did on Calvary – they are looking back, as they will during the 1000k. John is told NOT to measure the outer-court, because it and the city and land of Israel will be trodden down by the Gentiles for 42 months by the Gentile a/c; until Jesus returns and destroys a/c and armies at the end of the 70th Week. This is why the burying of the dead for 7 months in Ezek war, has nothing to do with the Mill Temple; the whole area remains defiled and become even more defiled by all the horrors of the Trib. The Trib Temple will be purged/cleansed from defilement 30days After the 70th Week ends. The whole area is shaken and burned with fire, the Trib temple erected by man will be annihilated in this destruction. I have done my best to quickly pull this together as I have only just had some bad news. Now my family is in shock and mourning for my mother’s young brother, my Uncle of 78yrs who collapsed about two hours ago. We have now been told they could not save him. My old mum and her remaining sisters could do with some prayer support please. I am 99% sure he is with Jesus. God bless you Billy and I will 'talk' to you and Susie a bit later. Life doesn't get easier that's for sure. For answers on the timing of the Gog-Magog Battle of Ezekiel 38-39, check out my article Timing Gog-Magog. LOL! Rodney and Sue are living examples of what happens when an irresistible force meets an immovable object. You and your family are in my prayers. Even if we know a loved one has gone to be with Jesus it is still hard to take because WE want them with US and miss them terribly. That's why I hope the Rapture happens soon so we ALL will be together forever with no more partings. My condolences about your uncle, Sue. Praise the Lord that not only did he live a long life, but that he has an eternal life with our Savior! Billy, my only comment for you is that the Holy Spirit leads us as individual believers unto all truth and shows us thing yet to come as is recorded in John 16:13! We must earnestly seek knowledge of whom we worship, the living Word of God that was made flesh and dwelt among us! I am a married man of 21 years with eight children, I love my wife and children very much, I also follow the mandate of the scriptures that identify with the husband being the spiritual leader of the home, this task I have never taken lightly nor would I lead my family to false doctrine. It is also assured that I will not allow an extreme feminist stormtrooper to seek to dominate my understanding of the scriptures! This pattern may work in charismatic circles where there is no discipline and the services are like a three ring circus. In this arena, emotions and so called spiritual experiences have replaced doctrine and rebelled against the natural order that the Lord and his Apostles put in place concerning the Church. "The aged women likewise, that they be in behaviour as becometh holiness, not false accusers, not given to much wine, teachers of good things"-Titus 2:3. Want to see where a Prophecy Scholar also agrees with my accessment regarding the imminent Gog/Magog battle of Ezekiel 38-39! Look no further then Prophecy In The News with host Gary Stearman joined by special guest Jimmy DeYoung. The program is entitled, "What's Really Happening in Israel? It is good to see that I am not the only one with eyes wide open! Gary was not the one presenting the information, Jimmy DeYoung was! Obviously you did not even view the video! It seems some here have their own agenda to stand in opposition to any credible evidence of the imminent fulfillment of key prophetic events. I am becoming further convinced that several individuals on this forum are either clones or at the very least are hiding the fact that they are using muliple identities! It would be nice to check the I.P. addresses of the responders here. E.I., you can have the floor back, I am vacating this insane asylum, just realized visiting hours are over!!! Sorry Nathan, looks like I was not up for this 3 Ring Circus after all, time for me to go to a more credible and monitored resource for fellowship. At least now you can return to the status of 0 comments on most of these streams! And ALL these‘things to come’ have been recorded within the sealed/completed Canon of Scripture written within the Bible. Thank you so much for your kindness. I have been like a lump of wood, unable to converse, and keeping to myself. Hubby has let me be, even though he is affected just as much. He has taken mum under his wing and is listening to her reminiscing, but all I have been able to do is cook a meal for us all. Finally I came here, to see your caring comments, and at last I began to feel, and have now had a good cry. Life, of late, has been one shock after the other; thanks to you three dear souls, I am able to begin the normal, healthy grieving process. I saw that broadcast when it first aired! It concerns todays News about Israel and the dangers she faces from her enemies. Which is a fact of life and has not even a resemblance of what you try to teach. Jimmy says none can be saved during the Tribulation. Gary Stearman and the late J.R. Church has a tendency to be sensationalism. Gary less so. Both Jimmy De Young and Gary Stearman have a near identical statement of faith to that of David Reagan of L&L. No doubt there are slight variations on issues, but otherwise are all Premill; Pretrib; Dispys all awaiting an IMMINENT RAPTURE of the Church. Rodney, people have varying end time views because we're a few puzzle pieces short of the whole picture at this time. There's no reason to break fellowship over it. Sue, praying for you and your family. Susie, praying for your health. I don't doubt you are a nice guy and devoted husband and father. In reading your profile I also say I have the greatest respect for you for your service to our country in the military. Soldiers are the greatest of Americans in my opinion. I also don't disagree with you completely. I'm still not clear about Psalm 83 being an actual end times event (you are definite it is not) and I do think Gog/Magog events could happen soon. I just wish there were nothing PERSONAL against anyone in your posts. This negative spinned banter between you and Sue is hurtful to me (and probably others) to read. Finally, please DO NOT abandon this website. You feel so strongly about your views that you should make them known. If someone disagree and discusses (or argues) then that is a good thing. It makes us think! We may not agreeing with you in the end (or we may) but it doesn't matter. You've added to very important topics. I would regret to see you go. As a new person to the Rapture idea, I could really see very little difference between the two people discussing the wars in Ezekiel and Isaiah etc. They are wars that pertain to Israel not our Rapture as part of the Church. I thought they both made sense in the fact as Nathan said, we don't have all the pieces of the puzzle. And my view is that as being a part of the Church and Rapture the puzzle piece(s) are for Israel. I hope the two of these see they both have valid views and personally I like seeing how they are similar not different. God Bless them both and also I as a old/feminist too, in love with the Lord. Please don't judge us by outward age,we are all just babies in the Lord's eyes. And thank you for my new name E.I. I definitely like it better than anon. Also am thinking of you in your sorrow. Losing anyone is always hard on the ones left behind.